"The people are on our side when it comes to climate change. Why?" she asked. "Because like you and I, they believe in science. "That’s why, in the first 100 days of my administration, I will reinstate the clean power rules and gas mileage standards and put forth sweeping legislation to invest in green jobs and infrastructure. And on day one, our country will rejoin the international climate agreement." 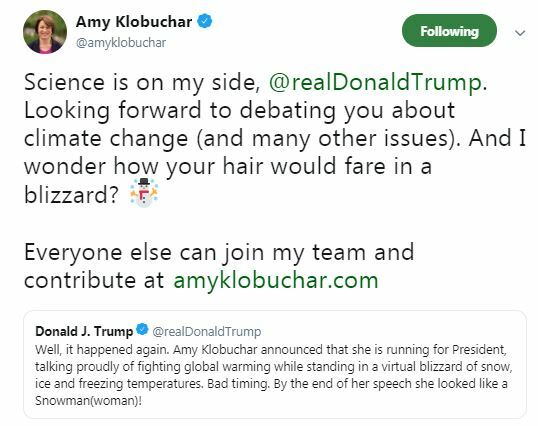 Appearing on ABC's "Good Morning America" on Monday, Klobuchar said the "snowwoman" nickname "could be so much worse." I'm sorry if it still snows in the world, but the point is that we know climate change is happening.Just this last year, it was one of the fourth hottest years in the history of the world. That's what's happening right now. We see this Greenland ice sheet melting. Look at those wildfires in Colorado and California, where you would have a dad trying to get through a fire, trying to calm his kid down in a car. That's what's happening right now in this country. So that's why I think we cannnot ignore it. And what I said to him back was, when he called me a snowwoman, I'd like to see how his hair would fare in a blizzard. Stephanopoulos asked Klobuchar, "How do you handle things like the tweets? Things like being called names?" "First of all, you don't go down the rabbit hole with everything he says," the senator responded. "You've got to have your own optimistic agenda. And Hillary had that. She would have been a tremendous president. But it got lost in that campaign. "So you have to pick your battles with him. And I think you have to use some humor, like I got to do yesterday, right away. Because, you just can't take everything seriously. He's trying to get into every story that you have. And you have to set your own agenda, and that's the only way we're going to move forward as a country. "As I said yesterday, we need to cross the river of our divides. As I stood before the snowy Mississippi River, America's greatest river, we have to cross a river of our divides, walk over America's sturdy bridge to a higher ground in our politics."